"On December 14, 1984 one of the most ambitious science fiction films was released: DUNE. This unique science fiction film saw the merging of the young talented director in David Lynch, the experienced hand of the De Laurentiis family, the music of Toto and Brian Eno, a wealth of talent behind the camera that designed the universe of 10,191 AG. All of this was built on the foundation of the legendary 1965 novel of the same name by Frank Herbert that has been praised as the best science fiction book of all time. To breathe life into the pages of the book was one of the best casts were assembled for a sci-fi film ever. What was hoped by fans, backers, and the production was the fulfillment of Herbert's vision in a science fiction epic film similar to the Golden Age Hollywood historical epics. Sadly, that did not happen for Lynch's DUNE. Costing more than $40 USD million in 1984 ($97 million in 2019's money), DUNE lost a fortune, garnered bad and confused reviews, along nearly bankrupted Dino De Laurentiis and Universal Studios. Decades have passed since then and fans of the book remain divided on the 1984 film, which has not enjoyed the cult status of fellow 1980s sci-fi films like BLADE RUNNER. One of the most controversial elements incorporated by David Lynch not found in the original text was the inclusion of the sonic weapons known as the Weirding Modules. So controversial was the Weirding Modules that few DUNE works have included these weapons. In this latest installment of The Weapons of Sci-Fi, FWS will be shedding light on one of the most controversial weapons in all of science fiction: the Weirding Modules of 1984's DUNE…." If only David Lynch had embraced the material. His vision of weirdness was actually perfect for the universe of Dune. Even so, it is a very good film. I would have preferred just sticking with the weirding way, though. Despite what the article says – Dune DOES have a cult following. Many simply prefer the full version, rather than the theatrical release. Others prefer what Lynch released instead. It's a very flawed film, that's for sure but, it's also an insanely elegant film with incredible sets and costumes. I agree with Starcruiser, Dune is a cult classic. Even Blade Runner had a cool reception when originally released. The Weirding Way is in the book, but the modules were added to the film to give the weapon a visual cue for the theater audiences. Some things are difficult to put into visuals without being silly or even more confusing. And remember, Dune is not exactly the easiest book to translate into film. The Weirding Way was a style of fighting that was developed by the Bene Gesserit that more than likely incorporated the use of voice as well. 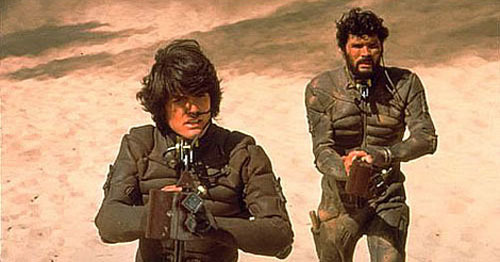 Yes in the 1984 movie we got the stupid modules but in the Dune TV Mini Series it was do like it should have been. Using Voice and body movement, very quick body movement, which is why Paul could move from a sitting position and move across the room to kill a Face Dancer assassin even when he was blind.